The EasyShed Gable Slider garden sheds are designed with sliding doors and a gable roof. 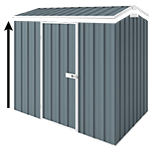 This model is large garden shed for all your storage need. This is the zinc steel model which is great for people on a budget because it's cheaper than Color bond.